First mentioned by name in AD 297, the Picts inhabited Northern Britain from the end of the 3rd century AD to the 9th. They rose to power in the devastation following Emperor Septimus Severus's repression of the Caledonians in AD 208, and dominated Northern Britain for over 500 years, before vanishing mysteriously. The Picts represent a high point of Celtic civilisation, rFirst mentioned by name in AD 297, the Picts inhabited Northern Britain from the end of the 3rd century AD to the 9th. They rose to power in the devastation following Emperor Septimus Severus's repression of the Caledonians in AD 208, and dominated Northern Britain for over 500 years, before vanishing mysteriously. The Picts represent a high point of Celtic civilisation, remaining free and unconquered beyond the borders of the Roman world, and rising to become the first barbarians to form a recognisable 'nation'. This title takes a detailed look at their origins, and examines Pictish heroic and warrior society, covering education and training, appearance and equipment, the status of women, and the experience of battle. 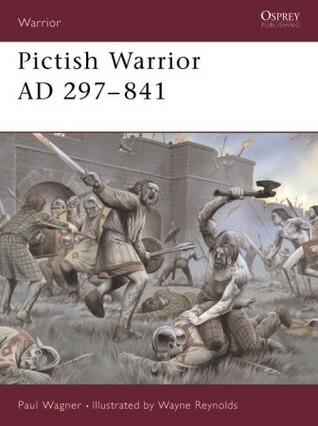 Considering the lack of Pictish historical record, this book did give quiet a bit of information. Good overall understanding of the warrior and pieces of culture of the Picts.